Portland's favorite punk metal combatants Toxic Holocaust recently completed the recording of their long-anticipated forthcoming new full-length. Titled "Chemistry Of Consciousness", the 12-track beast of an offering was recorded by the bandmembers themselves, mixed with Converge guitarist and renowned producer Kurt Ballou at his own GodCity Studio and mastered by Brad Boatright (Sleep, From Ashes Rise, Nails) at Audiosiege Engineering. Comments Toxic founder Joel Grind: "I'm excited to announce that the new Toxic Holocaust record has been completed. We recorded it ourselves like we did last time but this time around we had our friend Kurt Ballou mix. It's sounding so crushing! Lots and lots of distortion! Musically, I went into a more punky territory than the last record while still maintaining the Toxic Holocaust sound. I look forward to everyone hearing it!" "Chemistry Of Consciousness" is set to deploy this fall via Relapse Records. In the meantime, fans can still bludgeon their ear drums to the satiating sounds of "From The Ashes Of Nuclear Destruction", the monolithic 22-track Toxic anthology released earlier this year. Compiling over a decade's worth of demos, and various comp and vinyl-only split appearances, "From The Ashes Of Nuclear Destruction" is a historic compilation of hostile bliss and a must own for any Toxic Holocaust completist. 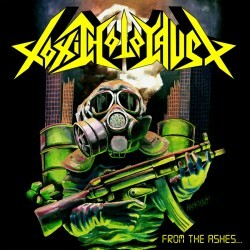 Toxic Holocaust mutated into existence in 1999, when Joel Grind merged his love for classic punk and metal into his ideal band. Like his influences â€” Bathory, Venom, English Dogs, Possessed, Broken Bones â€” Toxic Holocaust offers up blazing riffs, gravel-throated vocals, and a deadly fixation on the evil in man and a post-apocalyptic world wrapped in a Diy attitude.